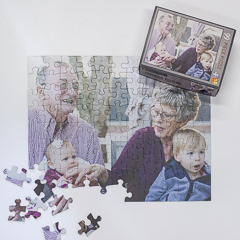 We see a wide variety of photo puzzles at Portrait Puzzles. So what are our favorites? 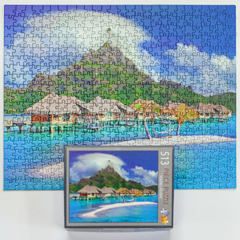 We have been making custom puzzles from photos customers upload for almost 15 years. During this time we have seen over 300,000 photos! While we do not have a favorite of all time here are some examples of the most popular categories. 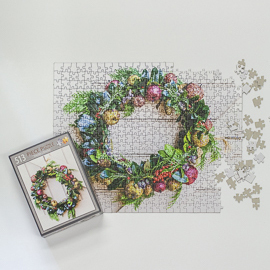 These custom puzzles all make great gifts. You can remind someone of that special day. Take someone to see the beach. Make a puzzle of showing off the family dog. The whole Portrait Puzzle team loves pets! We often have the shop dog in managing orders and looking for treats. 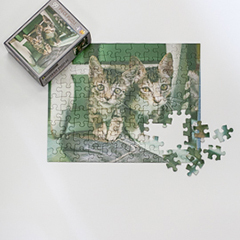 It is why pets are one of our favorite subjects of photo puzzles. No matter if it is a fun photo of the family dog or a basket of kittens. 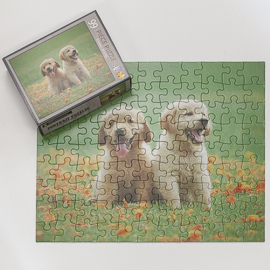 It is exciting to see pet photos come across the printer and pressed into puzzles. 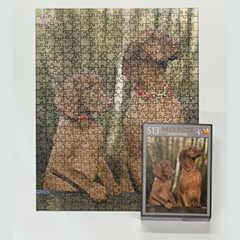 Show off your furry friends and order a pet photo puzzle with your pet as the star. During winter, the snow piles high outside of Portrait Puzzles. 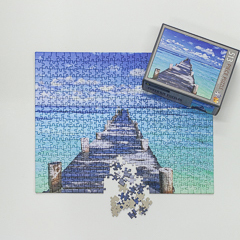 We want to see photo puzzles from that last beach vacation. 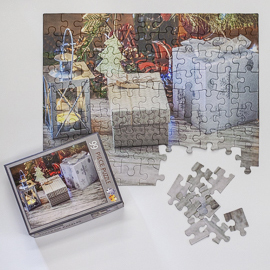 Photo puzzles are the perfect reminder of the last big trip. 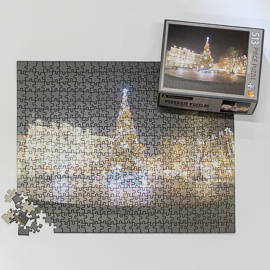 Monuments, buildings, mountain vistas can all transform into a fun photo puzzle. Take someone on a trip back to Europe without leaving the kitchen table. We have printed pictures from a birthday celebrations to actual birth days! Photos from when the whole group is together. 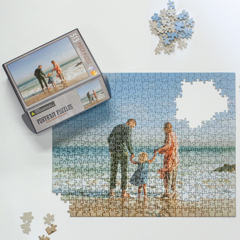 Family reunions, picnics, holidays all make great subjects for a custom jigsaw puzzle. We see generational photos and picture the entire family putting it together. 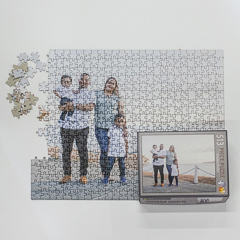 Challenge your family with one of our photo puzzles. We have a size that is perfect for every age group. When we talk about wedding puzzles that first photo of the bride and groom comes to mind. There are times that we get involved well before the “I do”. Yes, proposal puzzles! 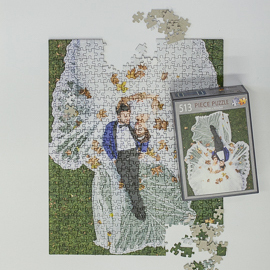 Ask that special someone to say yes with a puzzle of you popping the question. 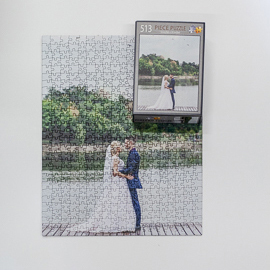 Photos of the bridal party, wedding ceremony, and honeymoon make wonderful, happy puzzles. Photo puzzles from old wedding photos make great anniversary presents! Take someone on a trip back in time. Christmas is our favorite time of the year! We get to see the photos from the past holiday season turned into gifts. Christmas isn’t the only time of the year for puzzles though. 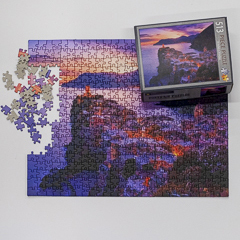 Our heart shaped puzzles are great for Valentine’s Day. Mom will cherish the photo puzzle of the kids on Mother’s Day. When you done with the turkey, breakout a puzzle on Thanksgiving. Every holiday can be photo puzzle day!